Some very kind friends in Montana invited my friend and me for golf and a football game. They spoiled us rotten in many ways including a great and different dinner! 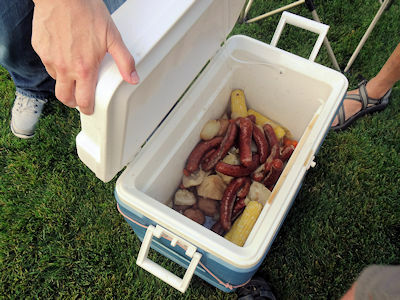 They layered bratwurst and vegetables in a milk can, added beer and heated it over a propane burner. Then the contents were dumped into a clean cooler and everyone helped themselves. 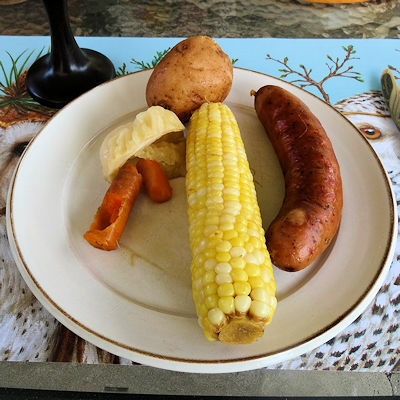 This made a really great meal. All the vegetables were fully cooked but still had a great firm texture. There was a great flavour that spread through all. I will have to investigate this and try it myself. Now I just have to persuade She Who Must Be Obeyed that I need a milk can.